Lifetime Achievement winner Ashley Bryan. 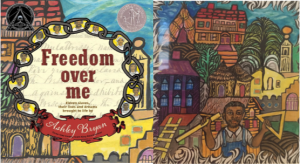 The exhibit consists of original artwork from 14 of Bryan’s books, including two that won the Coretta Scott King Award for Illustration: Let It Shine (2008) and Beautiful Blackbird (2004), as well as several CSK Honor award-winning books, including Freedom Over Me: Eleven Slaves, Their Lives and Dreams Brought to Life (2017) and Ashley Bryan’s ABC of African American Poetry (1998). For Bryan, a renowned artist, writer and storyteller, rhythm is essential to life, and this idea carries into the art he creates for every book. His use of vibrant colors along with rich language gives each book a sense of movement. His illustrations offer a visual lyricism. A perfect complement to this exhibition is the addition of a film in Bryan’s own expressive voice describing his childhood and the influences that led him to a life of sharing African American spirituals, poetry, and stories. To make the experience even better is the addition of colorful, moveable seating at the perfect height for children, set among wooden bins filled with his books at their fingertips. One could spend quite a bit of time just sitting, slowly turning the pages of his books while listening to his familiar cadence and resonant voice. 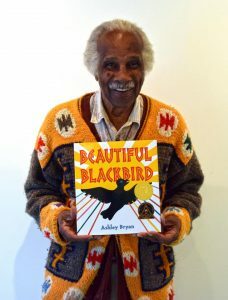 Ashley Bryan creates beautiful books that beg to be read aloud and shared over and over and over again. *This exhibition was organized by The Eric Carle Museum of Picture Book Art, Amherst, Massachusetts. Photos of Ashley Bryan’s art were taken at the exhibit with permission from the museum. Louise Capizzo is Teen and Youth Services Librarian for a public library in Scarborough, ME. A member of the CSK Technology Committee, Louise is also a blogger for The Nonfiction Detectives. I will definitely visit the exhibit when I’m in Maine this October. Ashley Bryan is a national treasure!